A few months ago, I reviewed Zozer Games’ Hostile setting for the Cepheus Engine. As I said back then, Hostile is the “real deal”—the perfect Alien(s)/Bladerunner RPG setting. Not an official setting, but one with the serial numbers partially filed off. It does its job magnificently, better, in my humble opinion, than the official offerings in this field. Wait. Unsuspecting? Not so easily. I’d bet that virtually every sci-fi enthusiast playing Traveller has seen the films. Some have read the numerous novels and comics as well, and played the video games. The moment a Facehugger shows up, or any other part of the Xenomorph’s life cycle for that matter, the players are bound to know exactly what they’re up against. This is a recurrent problem with using well-known settings (“IPs”, in 2010’s terminology): the player already knows the Big Secrets, unlike a first-time watcher of the films, or any of the characters in them. This removes a large part of the horror associated with these creatures. Fear of the unknown, of the alien—that’s the heart of Alien (1979). But the alien is no longer unknown. You could even say that it’s no longer truly alien. It’s a fixture of modern culture. 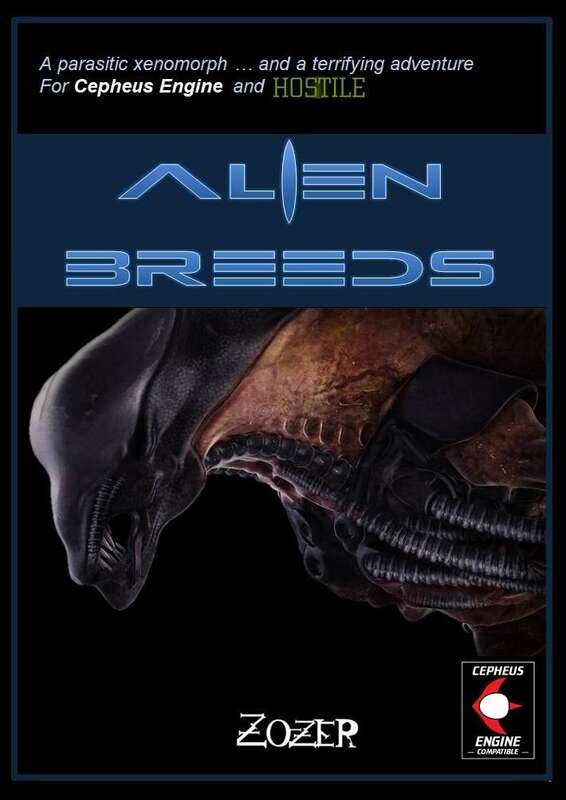 Alien Breeds tackles this question by presenting no less than 18 subspecies of the Xenomorph—each with unexpected abilities. I won’t list them here, to avoid spoiling the fun to any prospective players. But you should know that their capacities and capabilities exceed, by far, those shown in the films. They can do things to the unsuspecting—truly unsuspecting—player character that Ripley never had to face. Players will see a Facehugger’s husk, or a Xenomoph egg, and think they know what they’re dealing with. They’re in for a surprise. Potentially several surprises. A few breeds are quite predictable variants, but many are not what you’d expect from a Xenomorph. Aside from the breeds and a very well-written description of Xenomorph biology (both ordinary and variant, the book contains two additional parts. The first is a short description of Leyland Okuda’s (“not”-Weyland Yutani) science division, along with its ordinary roles and secret agendas. It also details the secretive “Project Red Midas”, studying alien lifeforms for military usage. The second is an adventure called, quite as you’ d expect, “Outbreak”. The adventure goes back to the original Alien film from 1979 for inspiration. This is not an action-packed Bug Hunt by Colonial Marines. Rather, it pits a commercial space crew against an insidious mystery on a remote mining colony. Don’t expect Smartguns and Pulse Rifles, but rather several mining lasers and two shotguns. The colony, like the original Nostromo, is initially “alive and well”, with an almost full number of workers, rather than the dead Hadley’s Hope of Aliens fame. Something is very wrong, and very deceptive, in this mining colony. The PCs come to refuel and unload supplies, but refueling will most likely require solving this mystery and dealing with some… err… wildlife. The booklet describes the colony in great details and clarity Even if you don’t intend to pit your characters against Xenomorphs, this is still a highly useful space colony which could be easily dropped, with minimal modifications, into virtually any interstellar sci-fi setting. The big gem here is a set of highly detailed colony maps and floor-plans, drawn by the talented Ian Stead. Very useful! In short, if you like Alien(s), or simply want a detailed space colony for your sci-fi game, this is an instant buy.